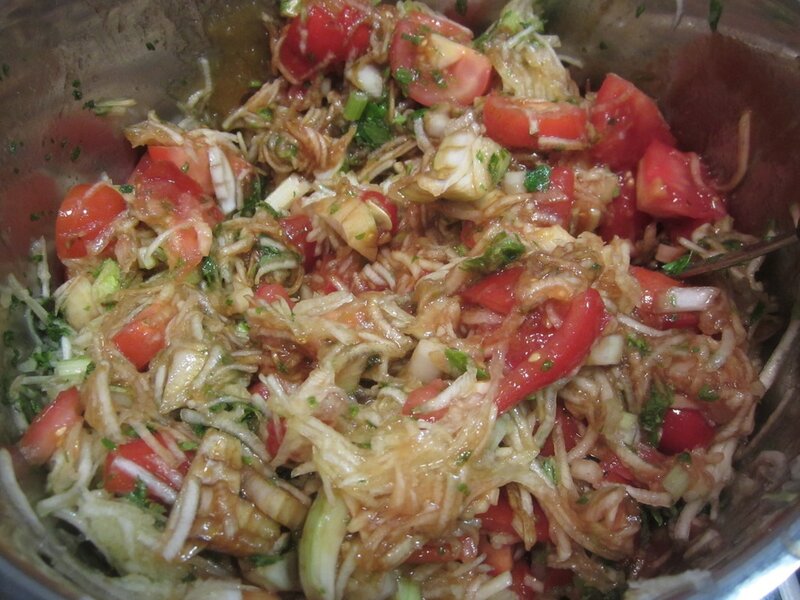 Sauerkraut, or fermented cabbage, is a traditional way to preserve cabbage. I make plain sauerkraut often, but really like this variation which comes from Nourishing Traditions by Sally Fallon. If you want an excellent cookbook full of recipes and wisdom for whole, nourishing foods, I highly recommend it! 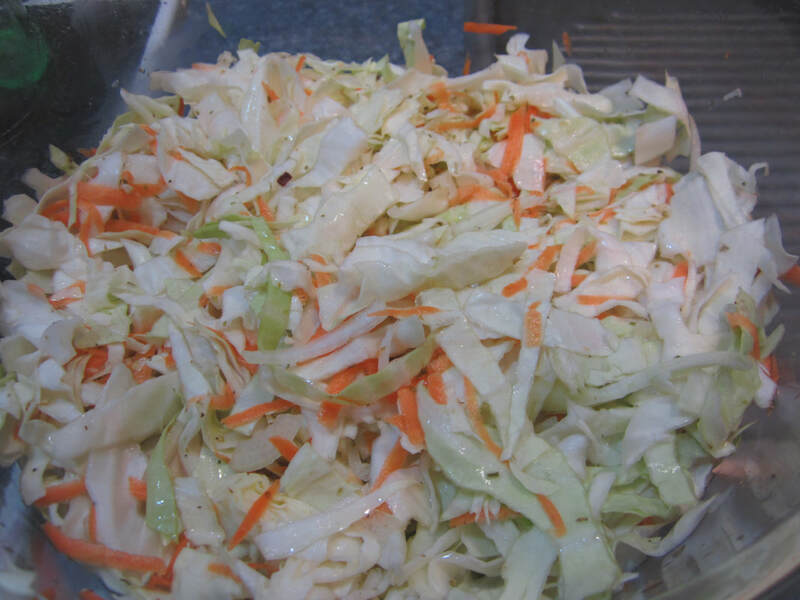 Making any sauerkraut with homegrown cabbage is a total dream compared to store bought cabbage, as the latter is much drier and requires a lot more work to pound out sufficient fluids to cover the vegetables. Homegrown ones are so loaded with fluids that it's super easy. Note: the book also has an alternative version using a homemade pineapple vinegar instead of salt/whey. Can't wait to try that one day as it sounds yum! Place all ingredients except salt/whey into a large glass or ceramic bowl. Lightly mix by hand. Sprinkle over salt/whey, and toss through to mix. Cover the bowl and let sit for 10-15 mins. 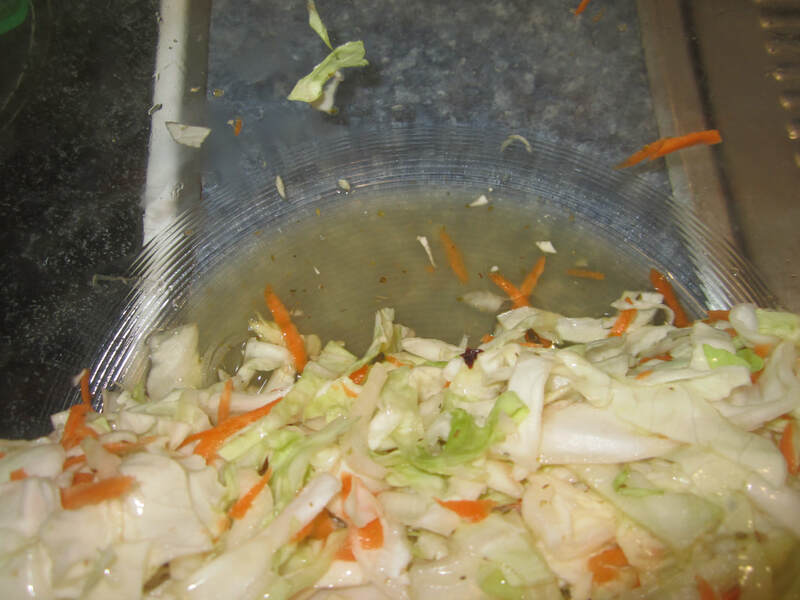 Now, squeeze the cabbage mix with your hands, crushing it, causing liquids to drip out. If it's homegrown cabbage, you only need to do this for a couple of minutes. 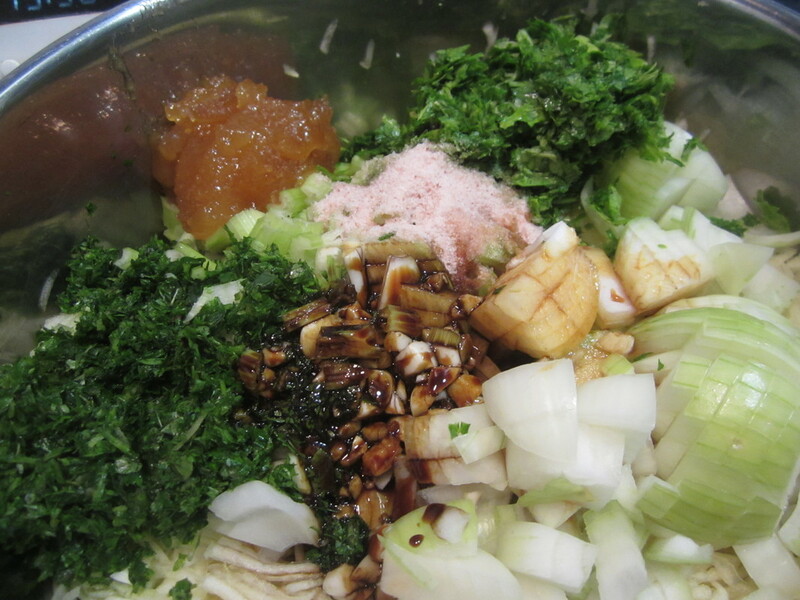 With store-bought you will need to pound the cabbage with a wooden pounder or meat hammer for 10-15 mins. Take 2 clean quart jars. Add small quantities of the vegetable mix to a jar at a time (being careful not to lose any of the fluids from the bowl/dripping veges), using a kraut pounder or the end of a wooden spoon to firmly pound down the veges. Keep adding more, and pounding down until jar is full. Repeat with second jar. Pour over the remaining fluids from the bowl. All vegetables should be covered with liquid, and the top if the mixtures should be at least an inch below the rim of the jars. Fold up the set aside whole leaves and place in the top of each jar, to hold the veges submerged (you will throw away these leaves after the fermenting is done). I also added a silicon muffin cup for extra packing. Cover jars tightly and set on bench in a suitable drip tray (as they will probably overflow). 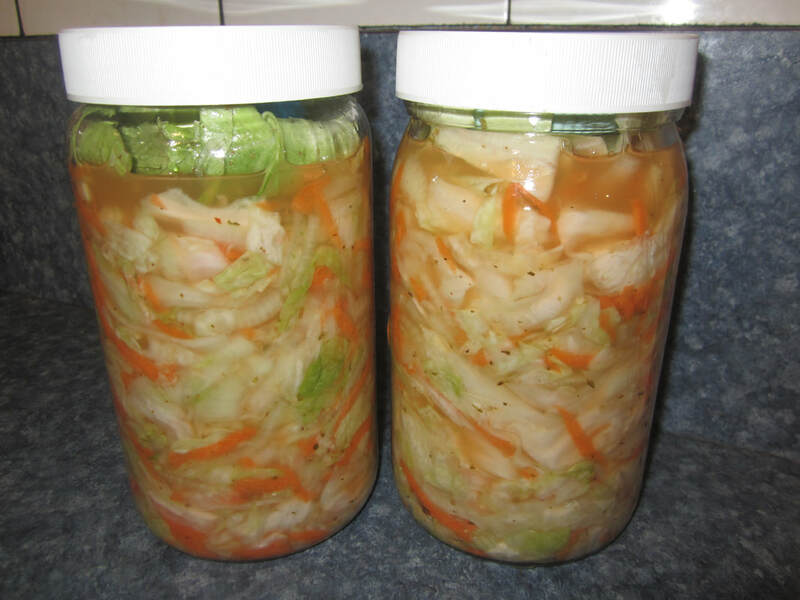 Leave to ferment at room temperature for 3 days before moving to the fridge. Enjoy! When the chives are flowering, use some to make this very pretty and delicious flavoured vinegar - simple as! 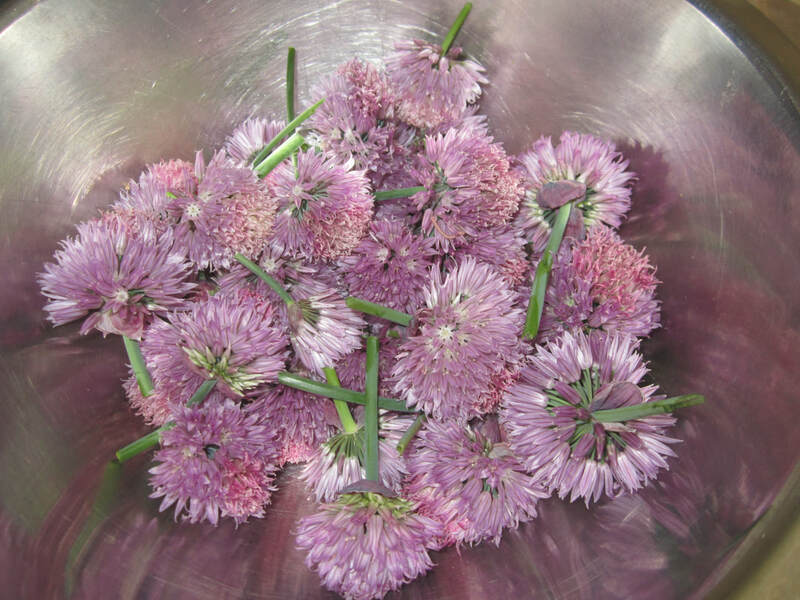 Pick healthy, pink chive flowers. Remove any insects by swishing through a bowl of water a few times. Then either drain and pat dry, or spin in a salad spinner to remove excess water. Remove stalks, and measure chives. Place in clean glass jar. For every cup of flowers, add 1 1/2 cups apple cider vinegar (ideally raw/organic). Stir, then place lid on jar and set on bench out of direct sun. Shake every now and then for 2 weeks. Decant vinegar into clean glass bottles and discard flowers. Refrigerate. Note: make sure the vinegar is well labelled, as unsuspecting family members may mistake it for cordial! 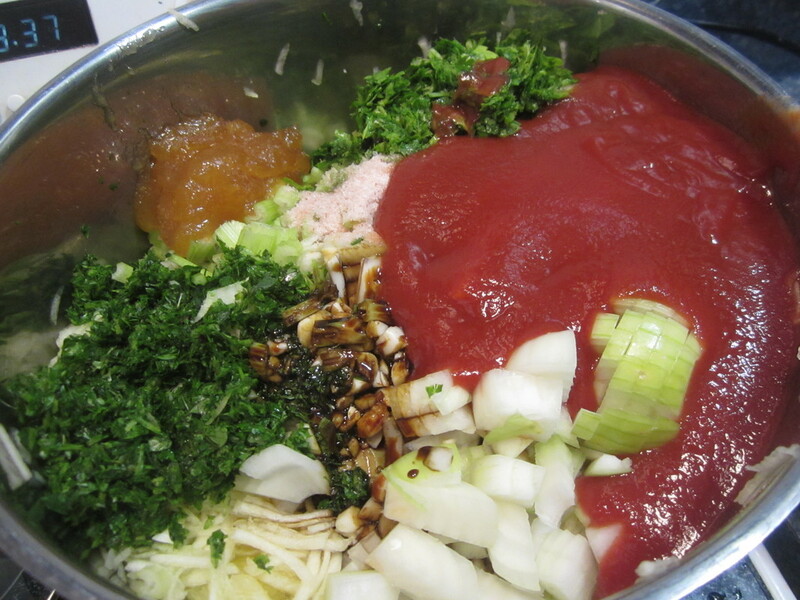 Use the chive vinegar to make salad dressings etc, such as this French Dressing. 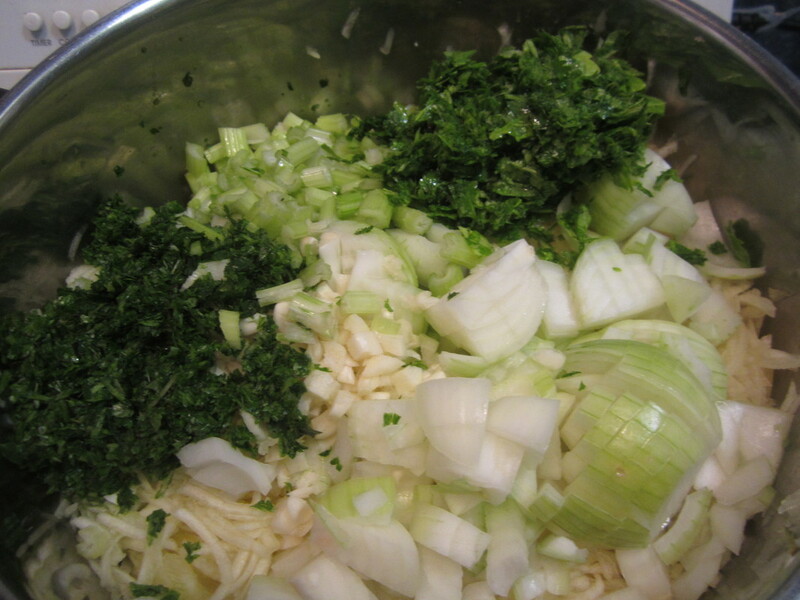 Blanching vegetables before freezing stops enzyme action which prevents them deteriorating. 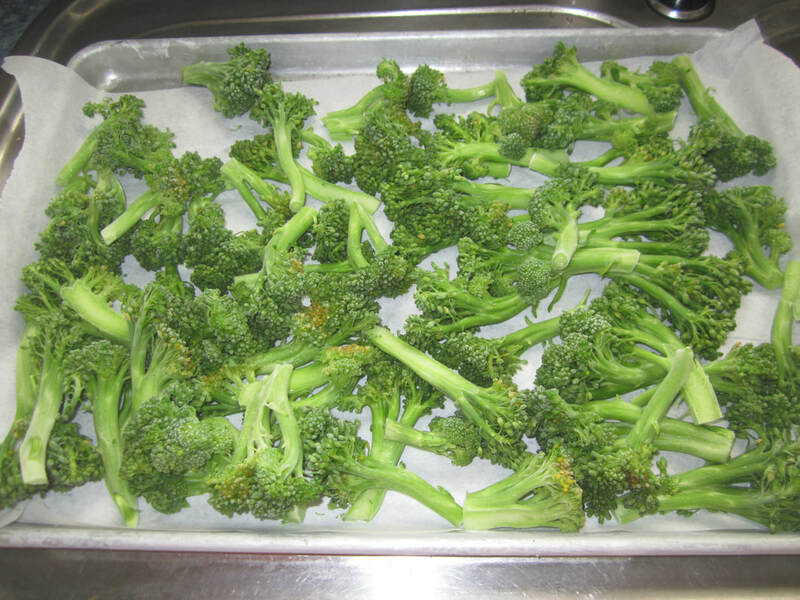 When I have more broccoli or cauli than I can use at once, I blanch and freeze the rest for later use. Bring a large pot of water to the boil. Wash vegetables and cut into even sized florets. Slice in half any thicker stalks. Either: lower a colander or metal basket (if you have one) full of vegetables into the boiling water, or if you have only the amount for one batch, simply drop them into the pot. Replace the lid and time for 3 minutes. 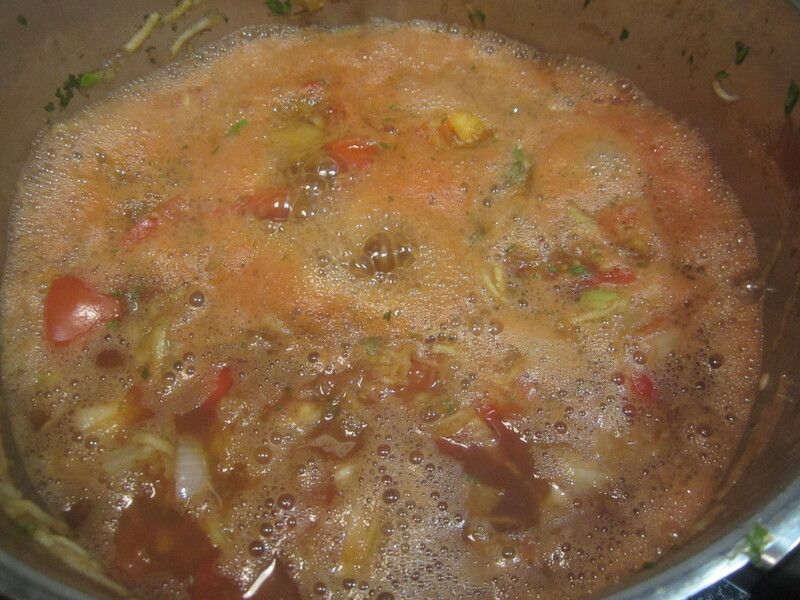 Immediately lift out or drain the vegetables and dump into the iced water to rapidly cool and prevent further cooking. Drain again, and place well drained veges on clean tea towels, and gently pat to remove excess water. The next day, remove from the freezer, gently separate any florets that have stuck together, and place loosely into a large ziplock bag or container. Return to freezer. To use: remove the amount you wish to use. Thaw if you wish to use it in a salad, or cook from frozen either by boiling or steaming, or adding to stir fries. ​Frozen cauliflower, steamed, makes excellent cauliflower mash (just whiz in the food processor after steaming, with a little butter, sour cream or coconut oil). Excellent substitute for mashed potatoes. Note to self: Make ice cubes every day, and dump out into container or similar, so I can make more. 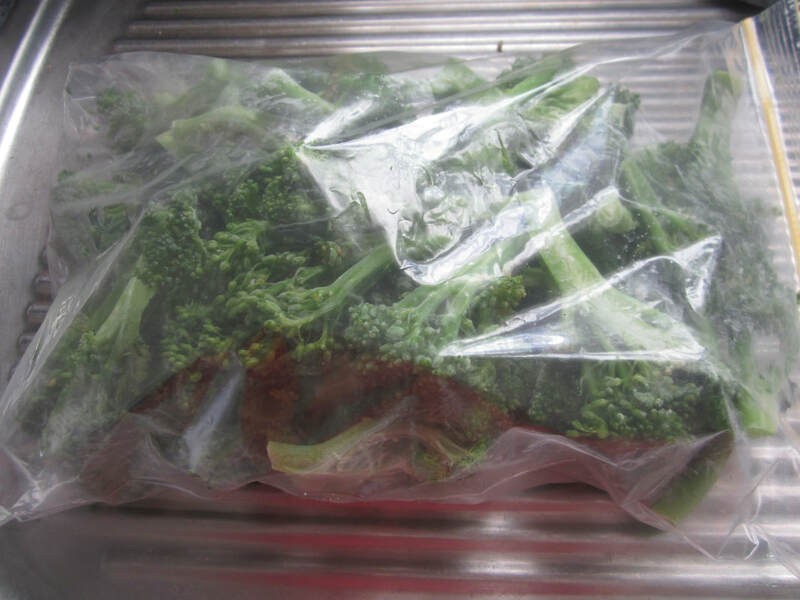 Keep this up for a large supply at the time of year when blanching and freezing vegetables - saves buying bags of ice from the supermarket! This is my new-and-improved version, and is really good! Not too salty, crisp and tasty, with the probiotic benefits of naturally fermented vegetables. Based on recipe from Nourishing Traditions by Sally Fallon. Wash cucumber and slice into 1/4 inch slices. Pack into jar. Combine remaining ingredients and pour over cucumbers, adding more water if necessary to cover cucumbers. The top of the liquid should be at least an inch below the rim. Add something to weight down the slices - I put a silicone muffin cup in the top of each jar. Cover tightly, set into something to catch any overflow and keep at room temperature for 2 days. Refrigerate and enjoy. 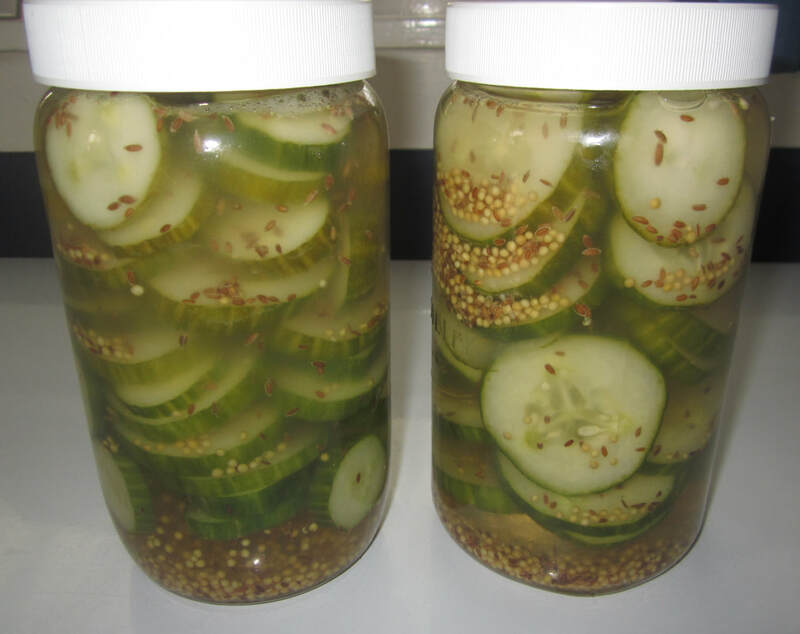 Note: if using whole pickling cucumbers/gherkins, keep at room temp for 3 days. While I was in jelly making mode today, I decided to use up some blackberries from the freezer to make seedless blackberry jam. Blackberry seeds are quite big, and I find them a bit gritty if left in. Blackberries are quite high in pectin, and easy to make into jam or jelly. This same method and process can be used to make jam from other berries too, though ones lower in pectin may need some pectin added. How to make homemade pectin is HERE, or simply combine high and lower pectin fruit in a jam, by adding some apple or quince to berries when cooking. Removing berry seeds is optional. Place blackberries into a large pot. Gently heat until boiling, and mash with a potato masher to release juice and help separate seeds and pulp. Simmer on low for 10-15 mins, mashing and/or stirring from time to time. Place a large sieve over a bowl, and pour the berries into it. Use a wooden spoon or spatula to force the berry pulp and juice through the seive, leaving behind the seeds. Work on it until you've got as much pulp as possible through. Ladle jam into hot, sterile jars, and seal. For more on how to prepare jars etc, refer HERE. The recent storms blew some very immature apples off our trees. I collected them up, and made three products from them. These apples have quite a bit of codling moth in them, so by the time I cut out all the yucky bits, I had one kilo of apple, which yielded 3 jars of apple sauce, 1 jar of apple jelly, and just under a cup of homemade pectin to use in other jams. After Stage One below, complete only such of the following stages as you wish to. 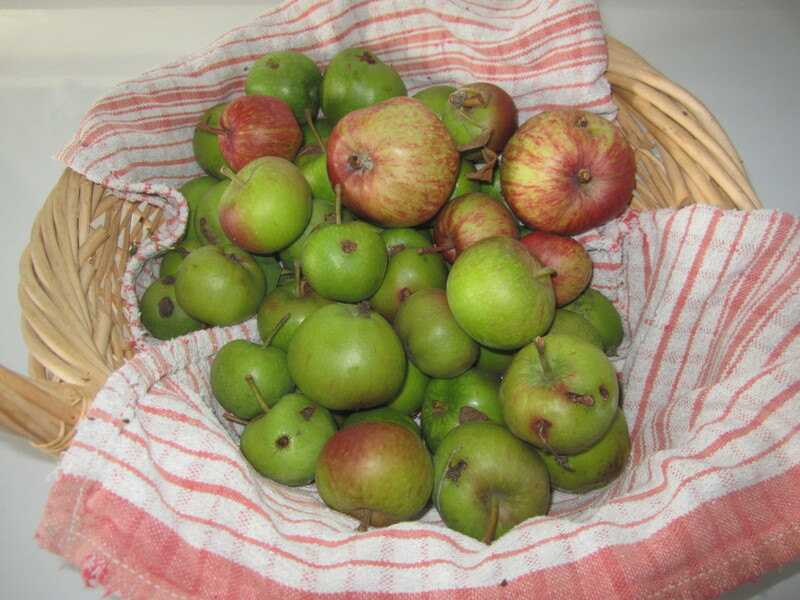 ​One might also have unripe apples from thinning fruit on a young tree - use as below. 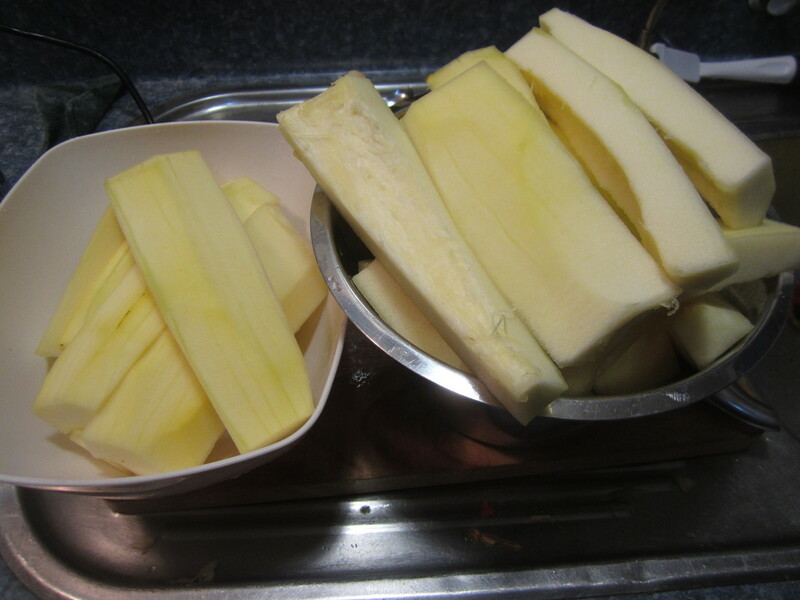 Wash the apples, cut up into chunks, removing cores, any damaged parts, but keeping skin etc. Weigh the useable apple. I had one kilo, so the following is for that - adjust to suit. Place apple into a large pot. Add water to just cover - about 4 cups. Bring to boil, then simmer - use a potato masher to mash them as soon as they are soft enough. Continue to cook on low for 15 mins, stirring occassionally. Line a colander with a double layer of cheesecloth or old, clean tea towel, or use a jelly bag. Set colander over suitable pot or bowl to catch liquid. Pour apple mixture into cloth and allow to drip overnight. Do not squeeze cloth/bag if you want a clear jelly to result later, otherwise squeeze if you wish. In the morning, you will find a cloudy liquid in the bowl, and the apple pulp that is very thick and almost firm - it keeps it shape when turned out onto a plate. Wash and rinse suitable jars for bottling the following items, depending which you choose to make. Stand jars right way up on a cold oven tray, and place in cold oven. Turn oven to 100C, and ensure jars remain in there for at least 30 mins from the time oven reaches temperature, to sterilize. Continue to keep at temp so remain hot until ready to bottle. Boil a pot of water on the stove. Place lids in pot and boil for 5 mins before using. ​You will also find it useful to have a preserving funnel to fill jars without spillage. I have one, but it's too wide to fit inside small jam jars, which is mostly what I've used for this. 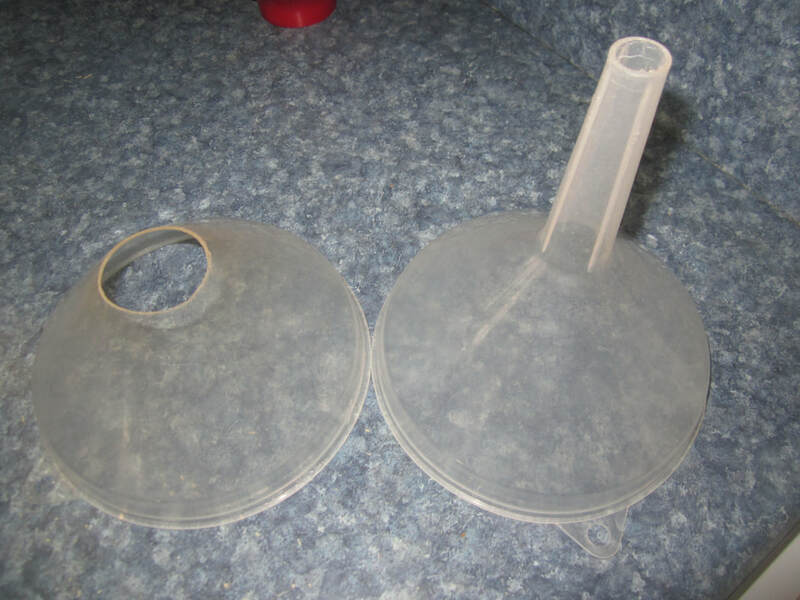 I also have a large ordinary plastic funnel, which I long ago cut the narrow part off of, creating a wide mouthed funnel that fits into jam jars and enables me to pour or ladle in liquids without mess. ​Place some folded newspaper on a wooden chopping boards to place hot jars on for filling and until they cool. The liquid that drained from the cooked apples IS homemade pectin. Unripe apples are very high in pectin, and the process of cooking and mashing the apples extracts the pectin into the liquid. Pectin is a polysaccharide found in varying levels in different fruits, which when boiled with sugar causes the thickening desired for jams and jellies. In other words, pectin is what makes jam set. You can use this home made pectin instead of adding purchased powdered pectin when making jams or jellies that need pectin added. The rate is roughly 1/2 cup homemade pectin for each TBSP of powdered pectin called for, though you may need to experiment a bit, as exact pectin content will vary. When making such a jam or jelly, start with that amount, and if it's still not setting, then add more. To store pectin until needed, freeze in suitable portions. If freezing in a jar, leave the lid loose until frozen, then tighten. Unripe apples are bitter and hard when raw, but once cooked they are palatable and edible, but not very sweet. 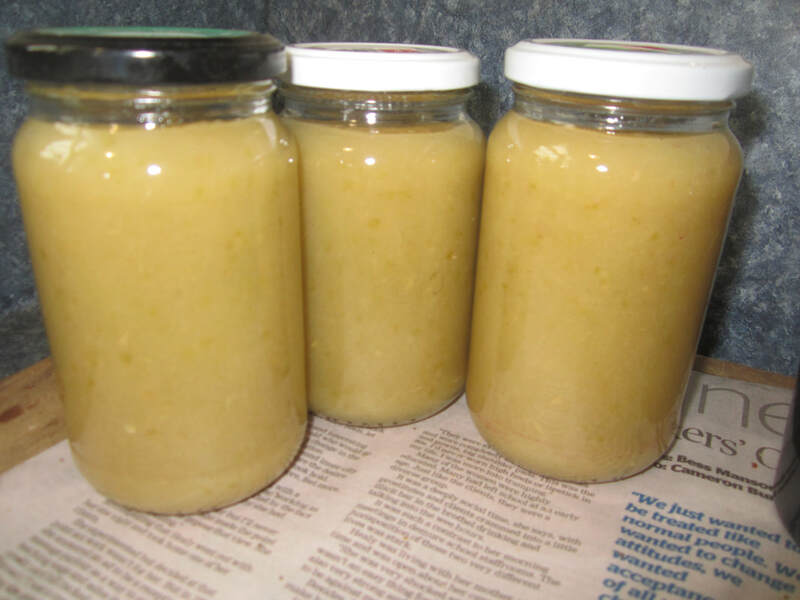 I used the pulp from the above process to make some applesauce, which I bottled to use in other recipes, such as my Curried Sausage Pie, in the future. (My regular applesauce is what I used on it's own or to top breakfast etc). ​Stir well. Bring to boil, and simmer on low for 5 mins, stirring frequently. Lift a jar from oven onto papered board, placed close to stove. Ladle applesauce into jar, leaving a 1/2-1 inch head space. Ensure rim is clean (using a funnel avoids making it messy), then secure lid and tighten. Set aside. Repeat until all sauce bottled. Leave to cool. Jar lids should pop downwards as the jars cool, if seal is secure. Otherwise rebottle or refrigerate and use. As explained above, the liquid from cooking the apples is very high in pectin, and can be added to other jams or jellies to help with setting. It can also be made into it's own apple jelly. For every cup of apple liquid pectin, add 3/4 cup of sugar. Heat together into a pot until sugar dissolves, then bring to boil and simmer, stirring regulary, until setting point is reached (mine took about 20 mins, but this will vary depending on size of pot relative to contents, how close to sea level you are, and how much pectin was in your actual apples). Setting point is judged by dropping a little of the jelly onto a cold plate and letting it cool. If it holds it's shape or is jelly-ish then set point has been reached. With high-pectin fruit jellies, I find there's no need for it to be VERY "set" as by the time you've got it in a jar, it will be totally setting with ease. Note: while the jelly is boiling, skim off any foam with a spoon as needed. I did this somewhat, but was also following a recipe that said to do this at the end, before bottling, which in this case didn't work very well because by that stage, the jelly was very gel like, and the foam mixed in and was harder to remove. Also note: the pectin liquid is cloudy in appearance. About 8 mins into boiling with the sugar, the liquid becomes transparent, and gives that lovely clear look and rich colour, though it can be marred by unskimmed foam, as happened to me in this case. Still tastes just the same though - sweet and delicately flavoured. Yum! 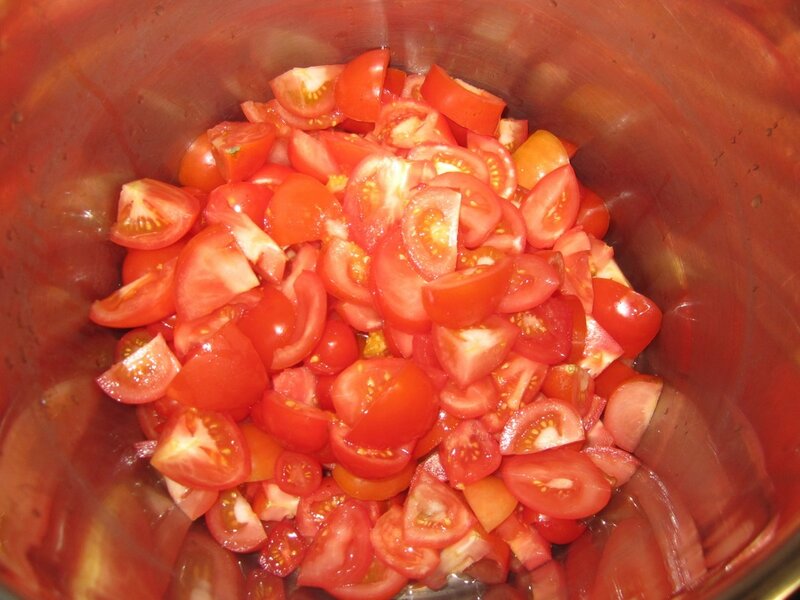 An easy to make and totally yummy tomato sauce. Save (or ask your neighbours for) glass bottles from cordial, dressings etc, and their lids, for bottling this. 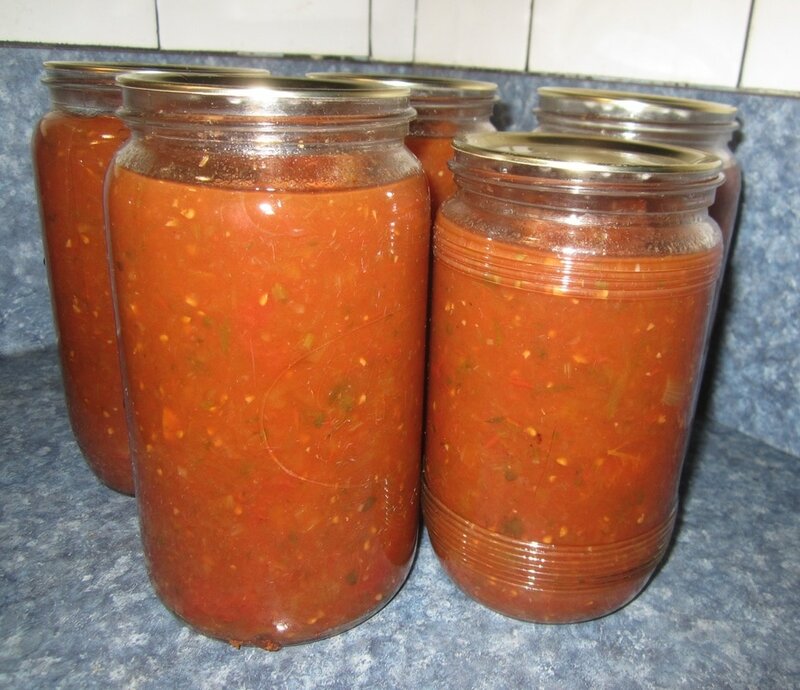 Usually made from ripe red tomatoes, one year I had lots of green tomatoes I needed to pick as well - I made one batch with red and one batch with green, and then combined them. The result was yummy! * To sterilise bottles, wash, rinse, then place in cold oven, turn heat to 100C and maintain for at least 30 mins - keep them hot after that until ready to fill. Boil clean metal lids in a pot of water for 5 mins. Can also use Agee jars etc. I had an unopened bottle of cream I bought for Christmas but didn't use. It's 4 days past it's best-before date, but perfectly fine. Since my husband and I are mostly dairy free, what to do with it? I decided to make cultured butter and buttermilk - very easy! 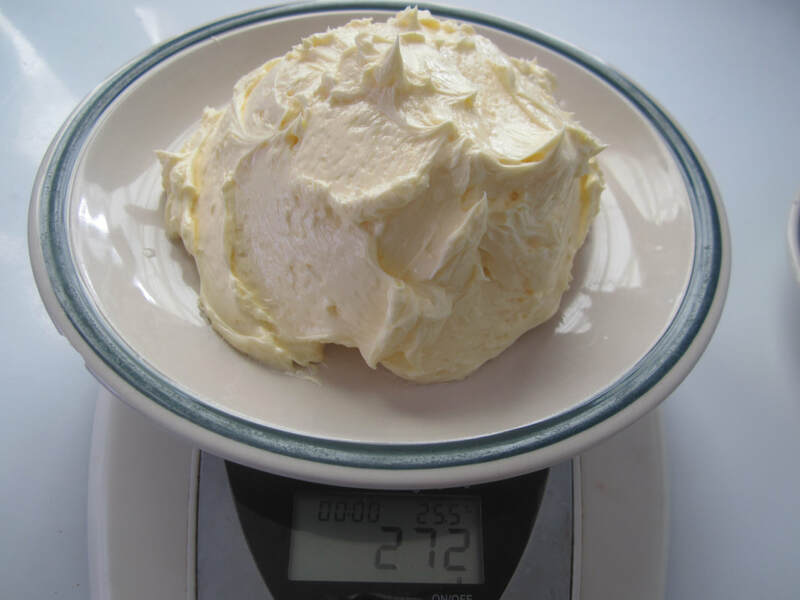 Place unopened cream on the counter and leave at room temperature for about 8 hours to sour a bit. 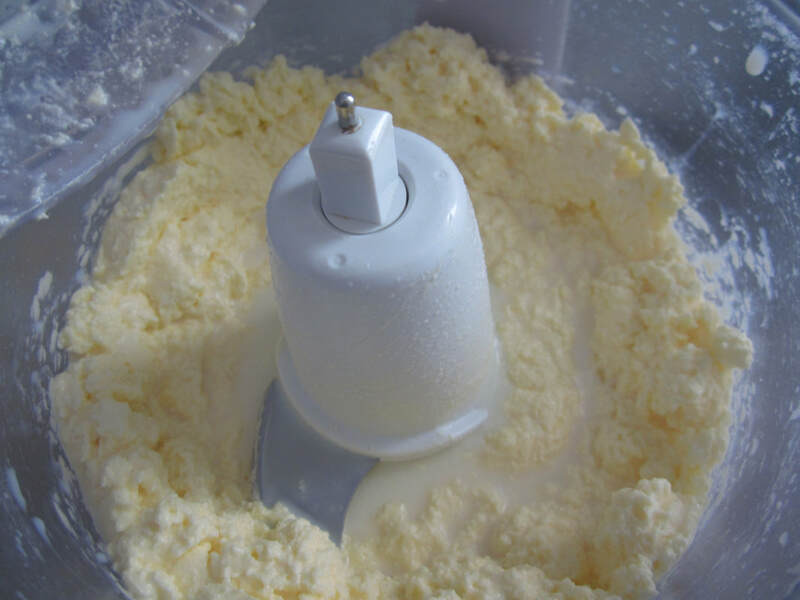 Pour cream into food processor, using a knife to scrape out thick cream that sticks to the inside of the bottle. 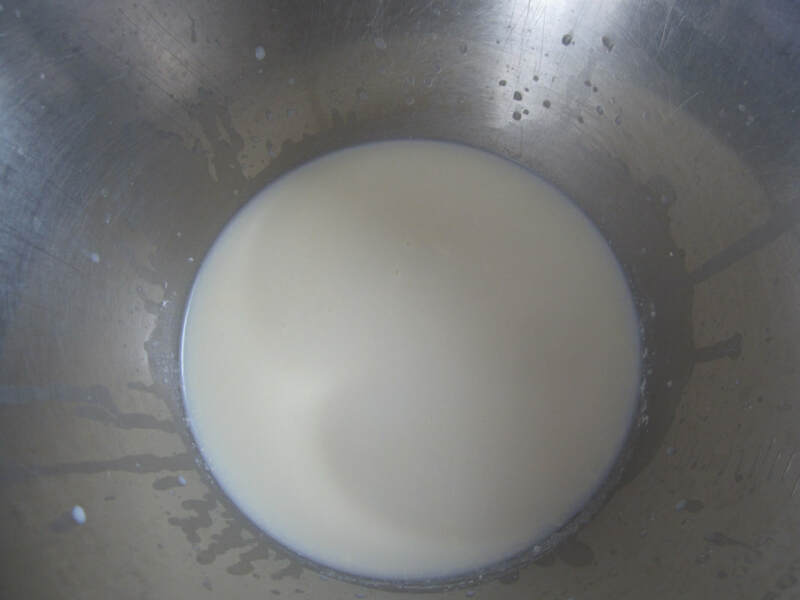 Process until cream separates into curds (butter globules) and whey (buttermilk). About 1 minute. Tip into a strainer set over a suitable metal or glass bowl. Let sit for a minute or two to drain. Do not press butter as you don't want to push it through the seive. 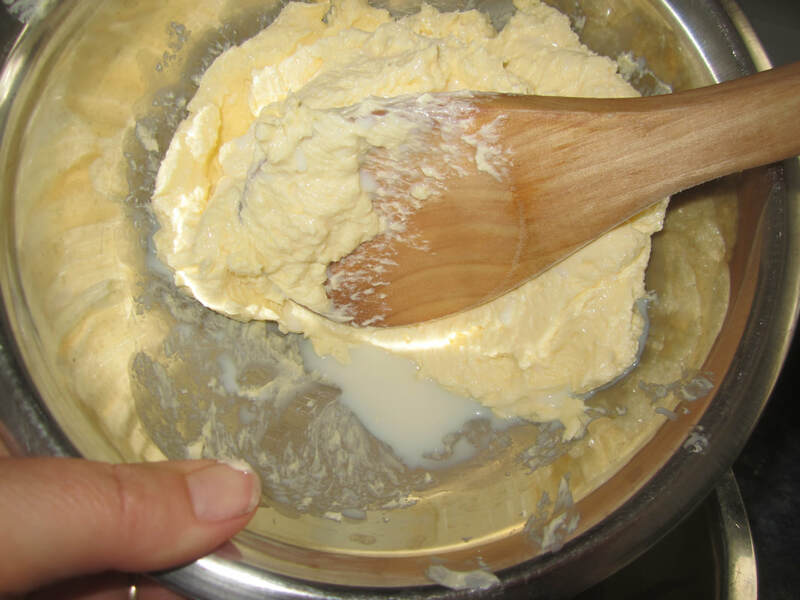 Tip butter into a separate metal or wooden bowl. Stir and press it with a wooden spoon, causing small amounts of buttermilk to run out - tip the buttermilk into the container with the rest of it. Do this over and over until you've got as much buttermilk out as you can. Pour buttermilk into clean glass jar, cap and refridgerate. 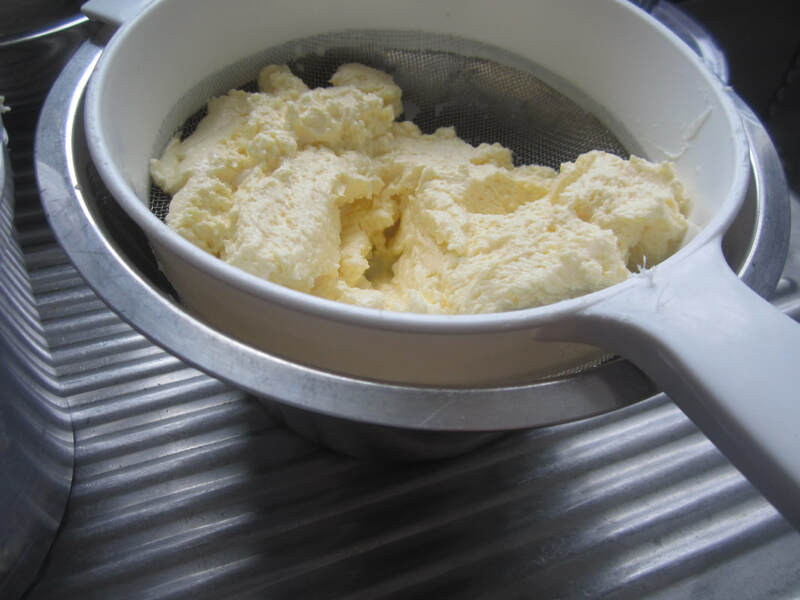 ​Now, slowly run cold water over the butter, holding your container on an angle over the sink and working and pressing the butter over and over so that the water washes out all remaining buttermilk residue. (This milky water is not kept, unless you want to use it in the garden). It is important to get all traces of buttermilk out - any left behind will cause the butter to go rancid much more quickly than it should. 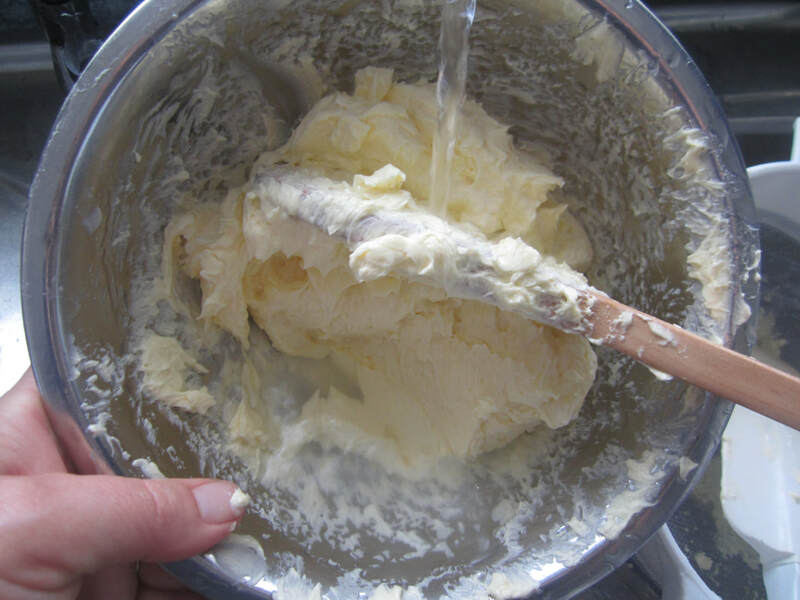 Form clean butter into whatever shape you desire and place in container. Refigerate, or freeze for longer storage. 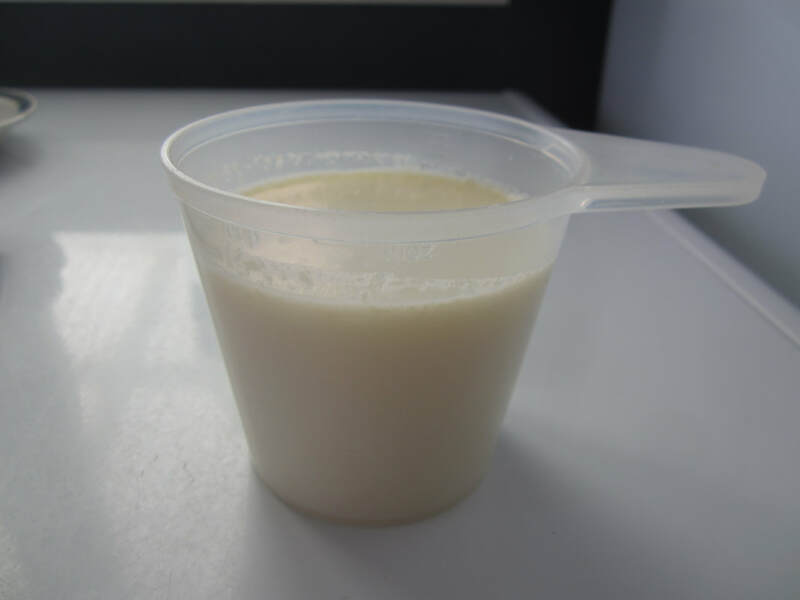 ​The buttermilk can be used in baking, or as a starter for lacto-fermentation of vegetables. Using whey/buttermilk in fermation means that less salt can be used, as the whey speeds up the process of formation of sufficient lacto-acid to prevent the vegetables from spoiling. I started making a version of this last year, and have been playing around with the recipe since. I've nailed it! This is so, so good! 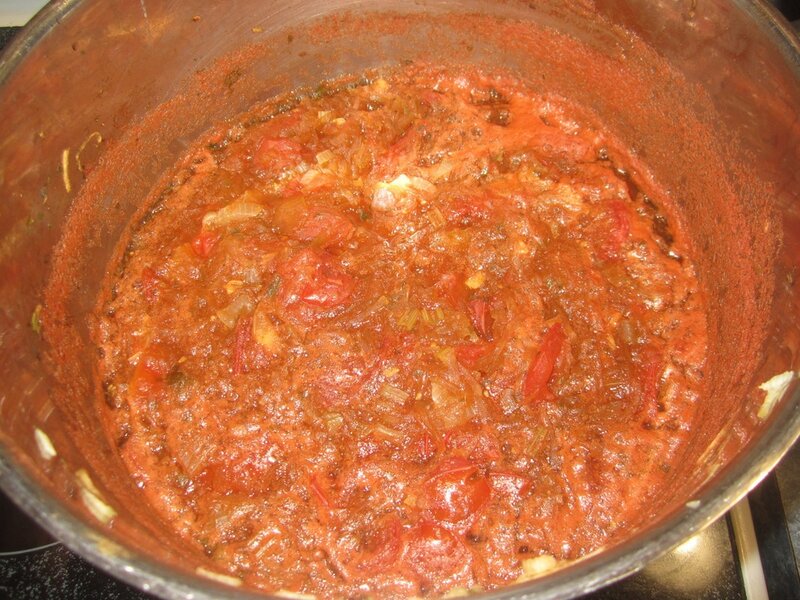 Lots of goodies from the garden made into a wonderful sauce that is good on it's own or as a meal base, such as a delicious bologanise that will have you drooling! ​It's also the perfect way to use up those huge marrows and any blemished tomatoes, which we often inevitably have at summer's end. You can vary the ingredients to use what you have on hand. My original version didn't have honey, tomato sauce, vinegar, nasturtiums or oregano, and used less marrow. But trust me, these things take it from a very pleasant sauce to something sublime! What a perfect way to preserve some of the goodness of summer vegetables and herbs for a tasty, nutrious winter staple. Just prepare everything and chuck it in the pot one by one as you go. 1/2 cup honey (I used up some older, crystalised honey; still works fine!). Can use sugar instead if you wish. Marrow ready to grate - a food processor will speed this up, but I used to do it by hand. Prepare each item as described above, adding to pot as you go. Give everything a rough stir together. 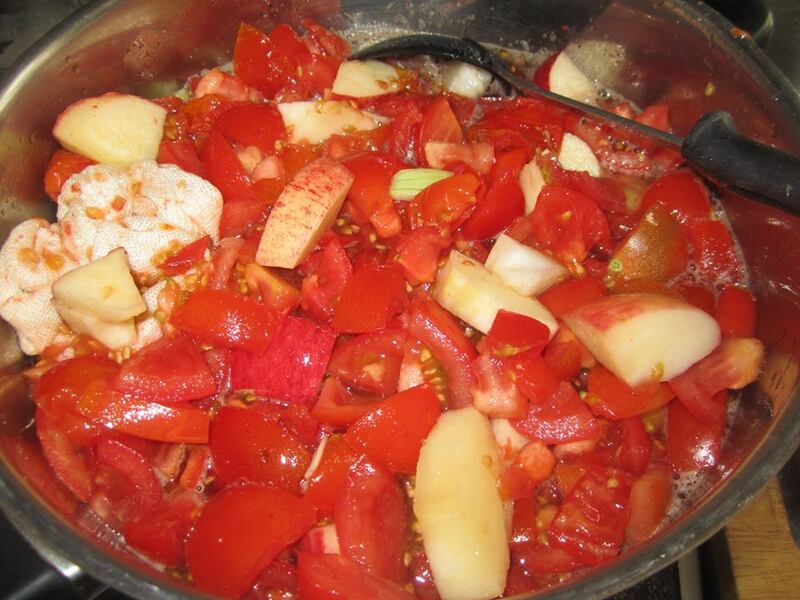 It will seem dry, but as soon as you start to heat it, the tomatoes and marrow will release a lot of moisture. Bring to the boil, stirring frequently. 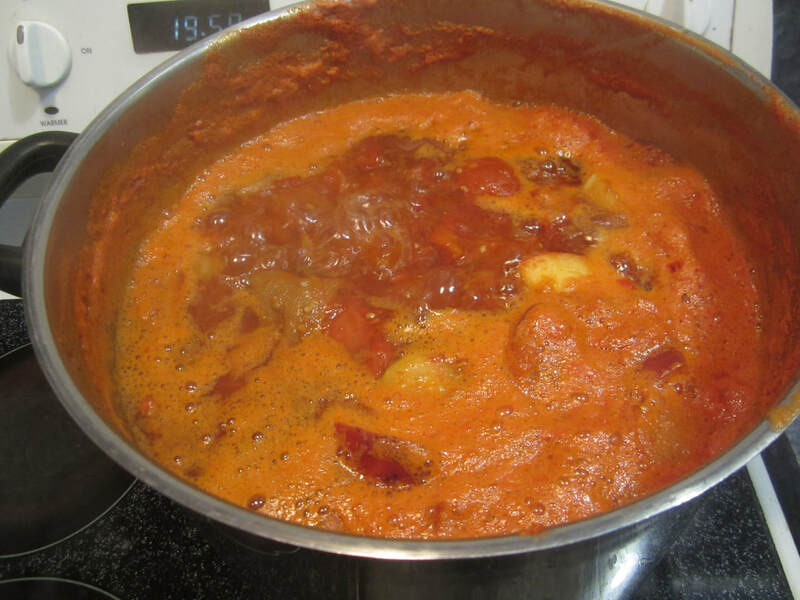 Reduce heat and simmer, uncovered, for 45-60 mins, stirring right to the bottom of the pot often to prevent sticking. Leave to cool. (I often make a pot of this in the evening, and just leave it covered on the stove overnight to cool down - it's no problem). You don't have to cool it completely before you carry on - I just find it convenient to take a break at this stage, and cooler mixes are safer to put through a food processor. Ladle about half the mixture into a food processor in batches, and blitz until smooth. Recombine blitzed with unblitzed portions (leaving some unblitzed adds texture and interest to the sauce). Return to the boil, simmer 10 mins, then ladle into hot sterile jars and seal. Makes 5-6 agee jars full. 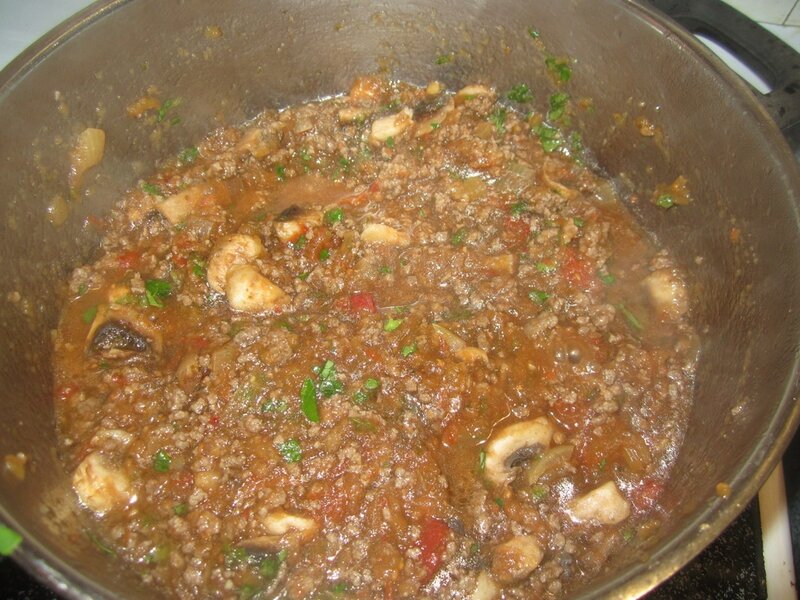 Brown 450g mince in a little coconut oil in a pot. Add chopped mushrooms (optional), stir in. 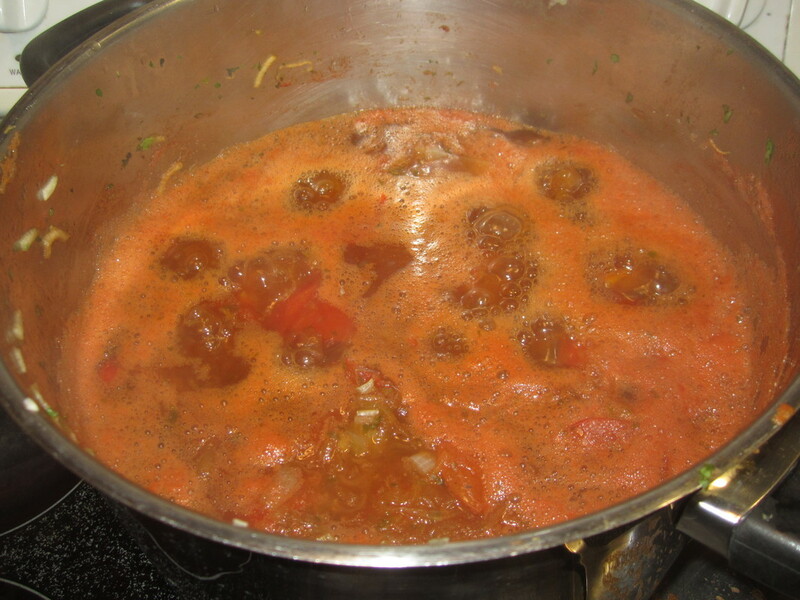 Add 1 litre jar of pasta sauce, stir. If you didn't use nasturtium leaves when you made the sauce, add some fresh ones finely chopped now (optional). Bring to boil then simmer 10-20 mins, uncovered. Thicken if needed with a little cornflour in water. Meanwhile, cook spaghetti pasta in a pot of boiling water for 10 mins or until el dente. Drain. 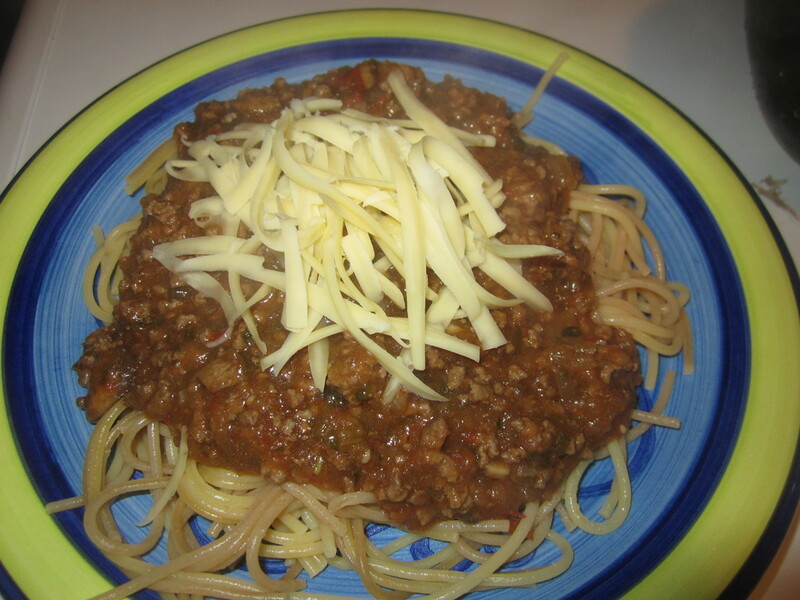 Serve by arranging pasta on plates, topping with the bolagnaise, and sprinkle with grated cheese. SOOO good! My family and I have long enjoyed slices of canned beetroot with summer salads and sandwiches, in home-made burgers and so on. It used to be something I regularly purchased from the supermarket in summer, but no more! That's because beetroot is super easy to grow, and making your own bottled beetroot is super easy too! Plus, of course, when you make it yourself, you know just what's in it (no nasty preservatives for us, thanks! 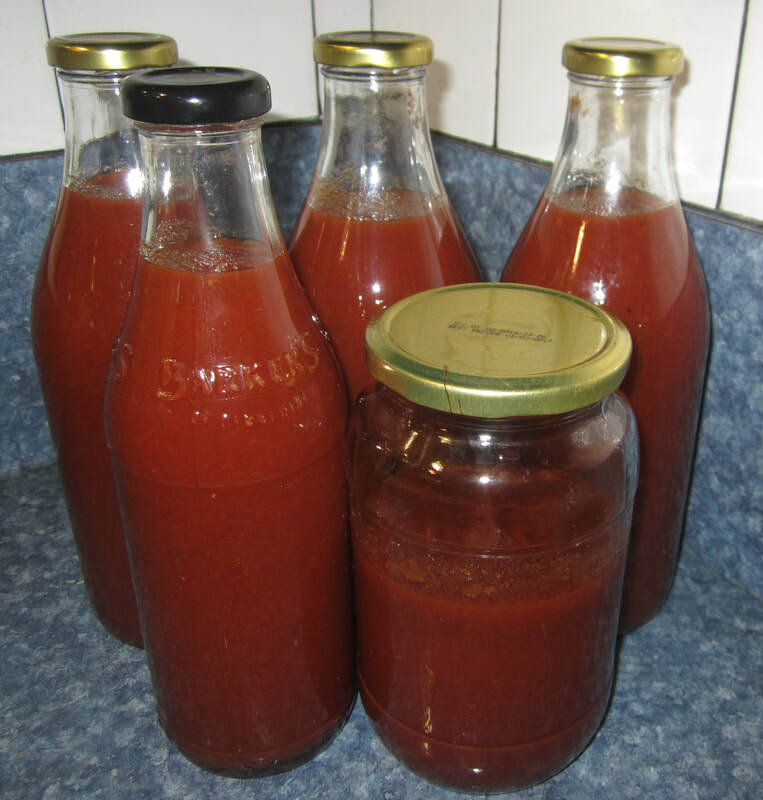 ), bottling (canning) it in a glass jar means no plastic can lining contaminants, and growing and preserving it oneself saves money. Not to mention you get a free bonus - beetroot greens (leaves) are super yummy and nutritious, and they freeze really well - cooking them for dinner involves dumping the frozen greens in a pot of boiling water and cooking for only 2 minutes! 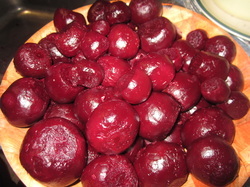 prepared beetroot (see below) - note I used about 2 times above ingredients for about 3 kg of beetroot. Bring all ingredients except beetroot to boil in large pot. 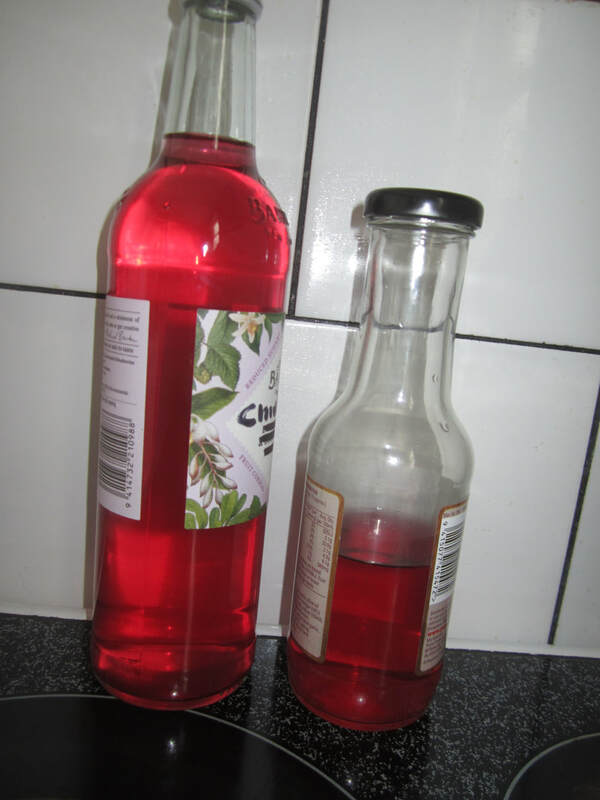 Add prepared beetroot in small batches, return to boil, then bottle using the overflow method. stems attached to beetroot (to prevent excessive bleeding). Do not remove long tap root at the bottom. 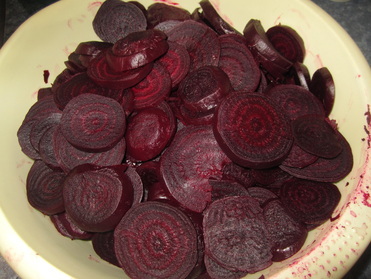 Scrub the beetroot well to remove any remaining dirt. 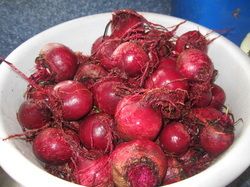 Place clean beetroot in a large pot, cover with water, bring to boil and then simmer until tender (about 40-60 mins). Slip skins off, removing tap root and remaining tops at the same time. They are now "prepared" and ready to be bottled. 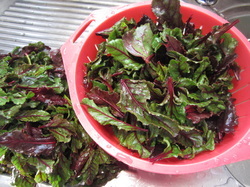 To prepare beet greens for freezing, pick through leaves and remove any that are damaged. Wash remaining leaves carefully, shake off excess water. Chop leaves roughly, then bag and label before placing in freezer. Simple! Of course, beet greens can also be eaten raw (in salad or sandwiches) or cooked fresh - freezing is for when you've harvested lots of beetroot and so have more greens than you can use at once.